To print this article, try highlighting the article (without highlighting the ads), then print only the "selection" (highlighted part of the page). When is a crane not a crane? Answer: When it is a dragline. Apparently the lawmakers had assumed that the presence of equipment on the site was an indication that the strip mining was not complete, since no one would leave expensive equipment sitting idle for a long period of time. Would they? Readers Leroy Bryan of Frogtown Road (near Penn-Craft) and Jay Smith of Baldwin agree with Bob Robinson that yes, indeed, they would. A couple of sharp-eyed readers also reported that the dragline along Route 51 still moves occasionally. Any reader wishing to further discuss their impressions of this unusual industrial “landmark” with Emmett Frisbee is invited to email him at octoberemo@yahoo.com or visit his web site at www.emmettfrisbee.com. In the same Roundtable article, Edgar Wright of Brownsville requested assistance in locating a historic church in this area. An author named Paul Garrett of Barberton, Ohio, is writing a book about early churches. Mr. Garrett wrote a letter to Edgar’s church (Mt. Lebanon Baptist Church of Brownsville) requesting information about a Baptist church originally known as the Philadelphia church. Mr. Garrett believes that the church was located somewhere in the Brownsville area and was established in 1791. He optimistically sent a map on which he hoped someone at Edgar’s church could mark its location. “This  church,” Ellis continued, “was a log building . . . 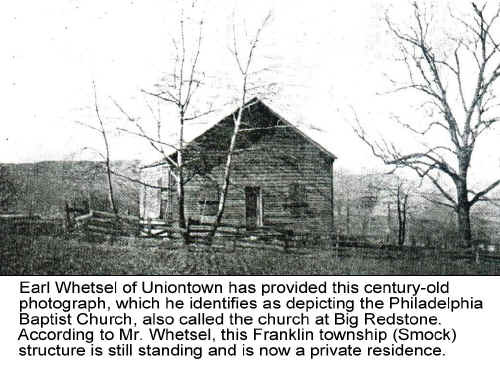 The present house of worship was erected in 1845.” By 1882, the year of publication of Ellis’ book, Ellis wrote that the church membership had plummeted to only seventeen, and “preaching is supplied once a month.” It appears that the 1845 structure is the church that Mr. Garrett is seeking and that Earl Whetsel identified as currently being a private residence. Are there any members of the Christian Church, Disciples of Christ, among our readership? If so, Earl Whetsel added an intriguing sidelight that involves the formation of your denomination. I have contacted Edgar Wright, and we will put Paul Garrett in touch with Earl Whetsel. Having satisfied Edgar’s inquiry, Earl Whetsel then asked a question of his own. Any reader who can help Earl find that information is requested to contact me. Our publication last month of a half-century old photograph prompted several of our readers to contact me to identify one or more individuals in the photograph. 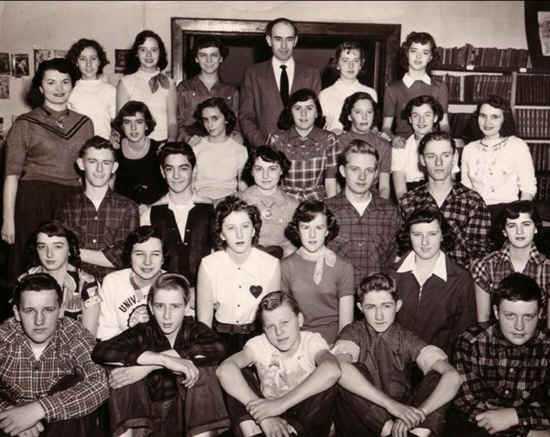 The photo, estimated to have been taken around 1953, is a picture of the staff of the Junior Brownie, a student publication that was produced at Brownsville Junior High School. Fifth row: Not identified, Sally Thornton, Doreen Hersh, Principal Sam Francis, Beverly Eastwood Ryan, Mary Ann Petrick. Chuck Thornton of Cape Coral, Florida has responded to Jean’s request. “I am a stamp collector,” Chuck wrote. “I have a large collection of covers, and if Jean Bright has questions, perhaps I can answer them.” I have put Jean in touch with Chuck so that she may have her questions about first day covers answered. My thanks to the Reader Roundtable for its excellent response to the first challenges of the new year. Readers may contact Glenn Tunney at 724-785-3201, at 6068 National Pike East, Grindstone, PA 15442, or via e-mail by clicking here. If you would like to receive these articles free each weekend via email, please email your name and present home town to Glenn Tunney by clicking here. To return to Glenn Tunney's Home Page, click here.